Juneau is Alaska's state capitol, and is only accessible via airplane or boat. It's located in a temperate rain forest and known as the least sunny city in the U.S. But, it makes up for the gloomiest of days with it's moody coastline, evergreens as far as the eye can see, and plentiful walking trails. All information was provided by Brooke who lives with her husband and two children in Juneau. They spend their days exploring and adventuring on this little rainforest by the sea. Windfall Lake - Take a few hours to hike this fairly easy trail, which ends at a picturesque lake with public use canoes that are available first come first serve. Boy Scout Trail to Eagle Beach - By far our favorite sandy beach to spend a warm summer day. The trail is about 2 miles one way and is stroller friendly until you reach the beach. Directions from town- turn left off Glacier Hwy at mile marker 26.5 (just before you cross Herbert River), turn right and park at the end. North Bridget Cove Trail - A beautifully diverse trail through wooded areas and along the coastline. Once you reach the second cove 1.8 miles in, there is a line of rocks on the shore that have been cleared to provide a sandy patch. It is lovely on a sunny day, but equally beautiful in winter. Trailhead is not marked- mile 37.2 of Glacier Hwy on the left side coming from town, there is a small parking lot. If you reach mile marker 38 or the fork in the road, you've gone too far. Perseverance Trail - This longer, popular trail goes through the valley of old mining land. There are a few off-shoots, but I recommend staying on the main trail until you reach the point where a large stream overruns the crossing boardwalk. Lena Point Trail - The couple mile trail ends high, overlooking Favorite Channel and the Chilkat Mountains (be cautious, especially with young kids). Bring a picnic dinner! Coming from town on Glacier Hwy, turn left onto Point Lena Loop Rd, follow it down & around until you pass the NOAA Lena Point Research Facility. There is a small parking area on the left in front of a gate. Walk just a bit further along the street to find the trail heading into the trees. Mendenhall Glacier - You can never tire of seeing the glacier! Mendenhall is nice because it's located right in the middle of town. From the visitor center parking lot you will have a few choices, my favorites being the walk to Nugget Falls (about 2 miles round trip on a flat trail) or the scenic viewpoint path which is maybe 1/4 mile roundtrip. The couple minute walk straight down to the "beach" is a great place for kids to throw rocks. If you have hiking gear and a couple hours, I recommend East Glacier Trail (take note: there there's a good amount of stair climbing!). In the winter there is also a great sledding hill down the stairs to the left of the pavilion. Skater's Cabin - Walk along the lake with views of Mendenhall Glacier. There is a shelter that can be rented out for bonfires. Although you can't see the sunset from here, it's one of my favorite places to view the glow on the mountains. Jensen-Olson Arboretum - This oceanside garden is not to be missed! 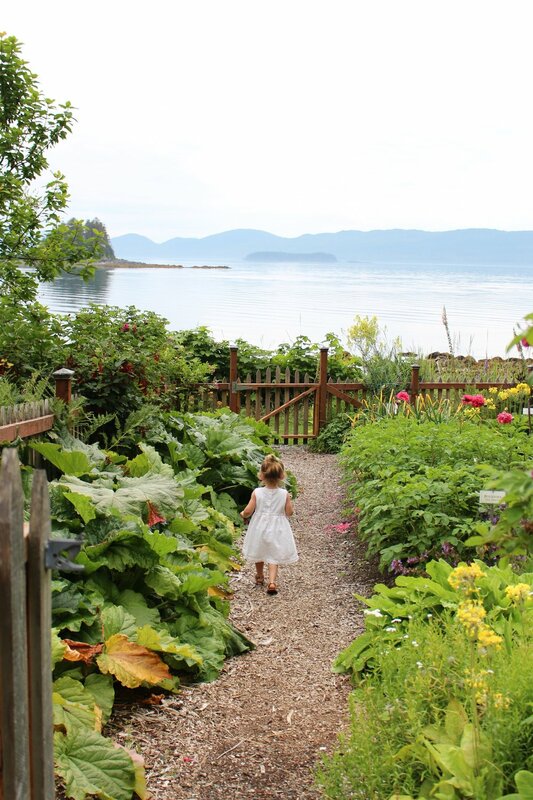 Walk through the pristine garden, then down to the beach. Point Caroline Trail (about a half mile round trip) is perfect for toddlers, as long as you keep a close eye once you reach the bench overlooking an ocean cliff. It's perfectly relaxing on a Sunday afternoon. While it is free and open to the public, please check their open hours. The garden is most beautiful in summer, while the trail is wonderful year round, especially fall. Brotherhood Bridge Trailhead - If you're visiting in July, be sure to walk through the field of fireweed while in bloom. The paved trail is bicycle and stroller friendly. Auke Lake - This easy trail goes partially around the lake, is stroller friendly in the summer, and the lake is also a great place to SUP or go swimming on a hot day. Flume Trail - If you're already downtown, check out this fun little boardwalk. Eaglecrest Ski Area - Besides skiing, this is a great place to blueberry pick in late summer. Park in the main lot and hike a half mile or so up the ski mountain dirt road. The best spots are the bushes surrounding the wooded areas. Don't forget your rain boots (it's always mushy!) and buckets! Auke Bay Boat Harbor - This is a favorite harbor to walk along because it's actively used year round. You might be lucky enough to view sea life- harbor seals, sea lions, star fish, humpback whales and eagles. Mount Robert's Tramway - Ride the tram up Mount Roberts and explore one of the trails for views of downtown & Gastineau Channel. Auke Bay Recreation Area - This rocky beach is popular for walking, picnicking & sunset viewing. There are several shelters which can be reserved for bonfires. There are several areas for parking along the road with stairs down to the beach, and if you continue driving toward the end you will see a sign for Auk Village Campground. You can walk to Point Louisa (the wooded point) along the coast or there is a trail through the campground. Sunshine Cove - At mile 35.9 of Glacier Hwy, this cove is mostly protected from wind, making it a great place to play in the gentle waves. Camping here is free, you just have to walk a short, but steep, distance down into the trees. Project Playground at Twin Lakes - Keep a close eye on your littles at this giant castle park! Savikko Park aka "Sandy Beach" - Located on Douglas Island (across the bridge from downtown Juneau), there a great playground for kids- just be aware that many people let their dogs off leash at this beach. While you're on Douglas, grab dinner at Island Pub pizzeria. Melvin Park - Located in the heart of the valley. Looking for some indoor fun for those gloomy days? Kindred Post - Located downtown, this small, but not-to-miss local post office is curated with unique art, gifts & toys. You'll find something special for everyone! Alaska State Museum - This newly constructed museum includes a kid friendly coloring room. Libraries - The Mendenhall Valley library is fairly new & the Downtown library has great views. Both locations have weekly story time & wonderful kids areas to escape to on a rainy day. Dimond Park Aquatic Center - Call ahead for hours of kiddy pool & waterslides. Field House "Turf for Tots" - Special hours where they pull out toys, slides & balls for the kids. Auk Village Campground - Located in Auke Bay Recreation Area, with access to Point Louisa Trail. Snag a camp spot with views of the ocean! Sunshine Cove - Free camping area at mile 35.9 of Glacier Hwy. Eagle Beach Campground - Snag a spot along the river! There are always fun community events going on around town. Check out the community calendar or events calendar. Sandpiper Cafe - Best brunch, downtown. Gonzo - Waffles, Auke Bay. Breeze In - Grab bakery items or lunch to-go. I recommend: bagels & cream cheese and their onion rings. Pucker Wilson's - Best burgers in Juneau, purple food truck located outside JACC downtown. The Island Pub gourmet pizza - Expect lots of pork on the menu! McGivney's Sports Bar & Grill - Standard sports bar, I recommend the burger & lobster bisque. Coppa Ice Cream - Try the rhubarb sorbet if it's available, downtown.